Enjoy easy shopping for clear electrical light switches and dimmer controls by major manufacturers. Clear devices are a good choice for coordinating with wall switch plates where a neutral color is best or a lighted device is helpful. Illuminated switches may be clear, or they may have a light within them. Shop all illuminated light switches here. 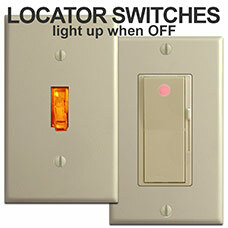 Locator switches illuminate when OFF, to help you easily find and navigate to them in the dark. 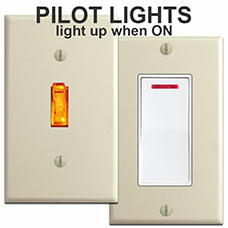 These switches illuminate when ON, to alert you that an out-of-sight light (such as an outdoor or basement light) is on. Learn more - see our Guide to Illuminated Light Switches.